Engage the Lost. Build up the Convert. Send out the Believer to make Disciples of Christ. Our Mission is the Commission of the Lord Jesus Christ before He ascension into Heaven. Our Mission seeks to emphasize the evangelical, active and outward focus that is at the heart of our replanted church. We also want to illustrate, through the changing of objects within the clauses, the transformation accomplished through Jesus Christ in us. Our Model, which drives all of our strategies, is to 1.) Draw people in, 2.) Build people up and 3.) Send people out. It is a constant, cyclical model of the Great Commission. 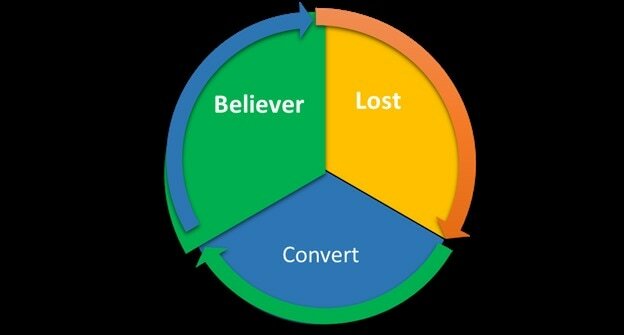 This means the Command to 'Go' applies to the Convert and the Disciple to reach the Lost.